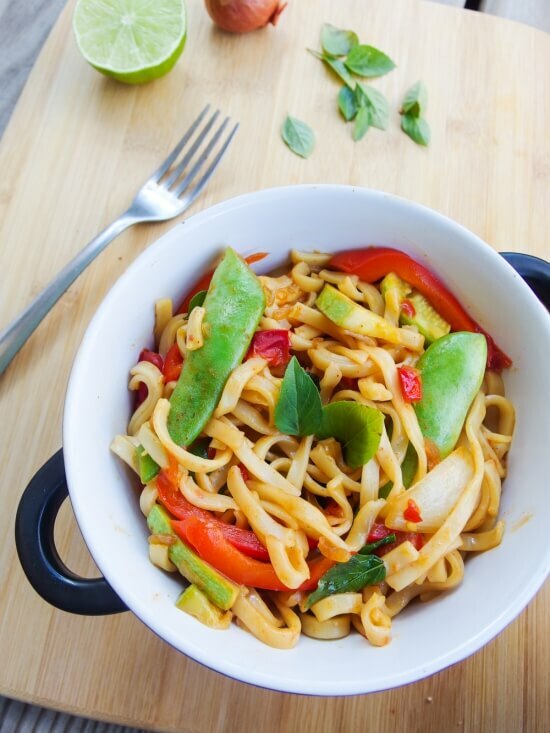 One Pot Spicy Garlic Almond Butter Noodles | Yup, It's Vegan! Yes, it’s August and I’m asking you to stand in the kitchen stirring a hot pan full of noodles. These are not just any noodles, trust. 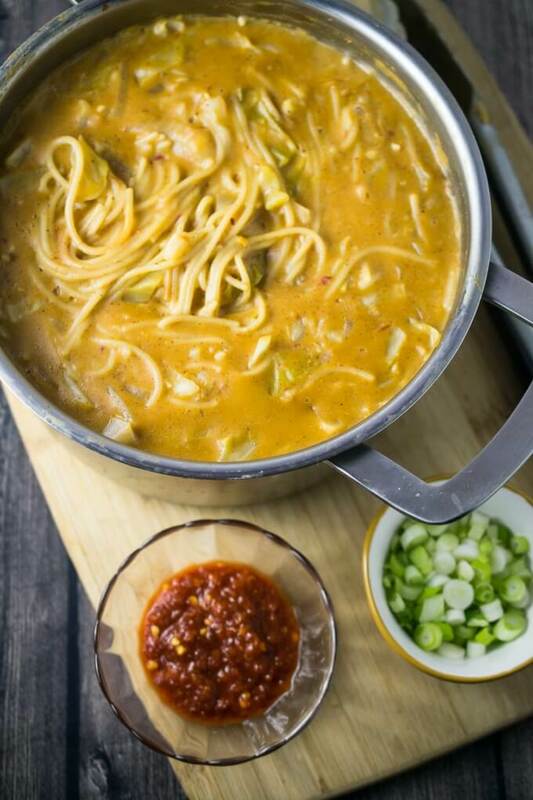 These are one pot chili garlic almond butter noodles, made by cooking brown rice noodles directly in a creamy almond butter sauce, spiked with sriracha and garlic and everything delicious in life. I’ve been making this recipe regularly since the winter trying to fine-tune it for sharing on the site here. At point point it contained ginger and sesame oil which have since been disappeared! But last week I finally realized that even if cooking the noodles seems a little finicky, the end result has always been obscenely good! So I didn’t want to wait any longer to share this almond butter deliciousness with you. 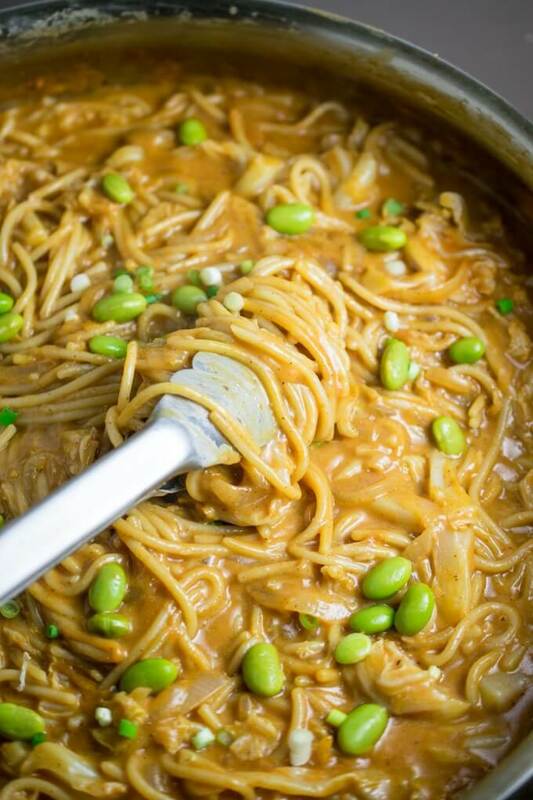 This is an Asian-inspired almond butter sauce, with perhaps not as strong as a flavor as peanut butter noodles. The main flavors come from vegetable broth, AB, soy sauce, sriracha (or chili-garlic paste, if you prefer), red onion, and a bit of tomato and rice vinegar for tanginess. 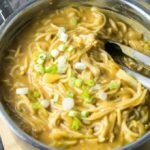 Once your one pot chili garlic almond butter noodles are done cooking, you’ll be rewarded with a super thick and creamy (dare I say “gloopy”?) 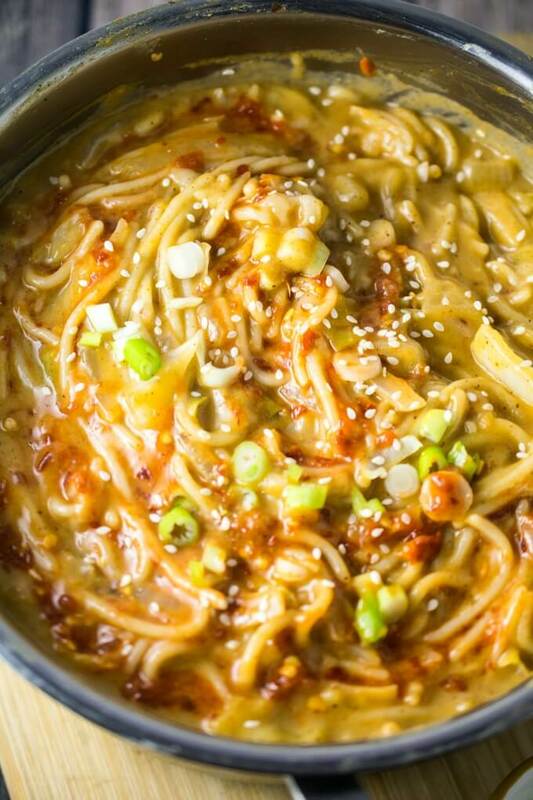 sauce coating tender noodles, with a tasteful spicy kick, and garlic and soy flavors. The napa cabbage gets cooked to perfection too, so it just has a hint of crunchiness left to it. The sauce is only the tiniest bit sweet from adding a dash of agave nectar. The noodles I use are made from just water and brown rice flour. You can try using regular (non gluten-free) pasta; the amount of liquid may need to be adjusted. These are not exactly the flavor profile of Chinese chili garlic noodles, but righteous all the same! For variations, add seasonal vegetables (see the recipe notes for suggestions), and/or a vegan protein of choice like tofu or edamame (pictured in some of the photos). I also sometimes serve this alongside a veggie stir fry. 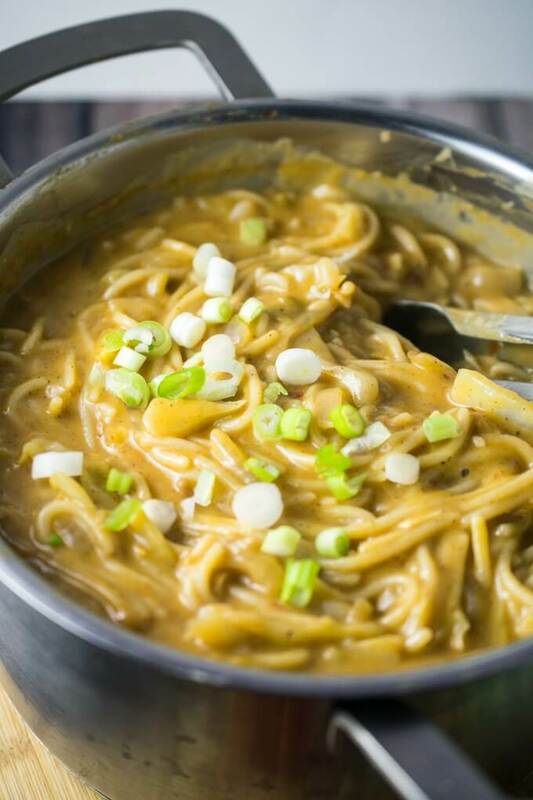 If you give this tasty one pot noodle recipe a try, let me know! 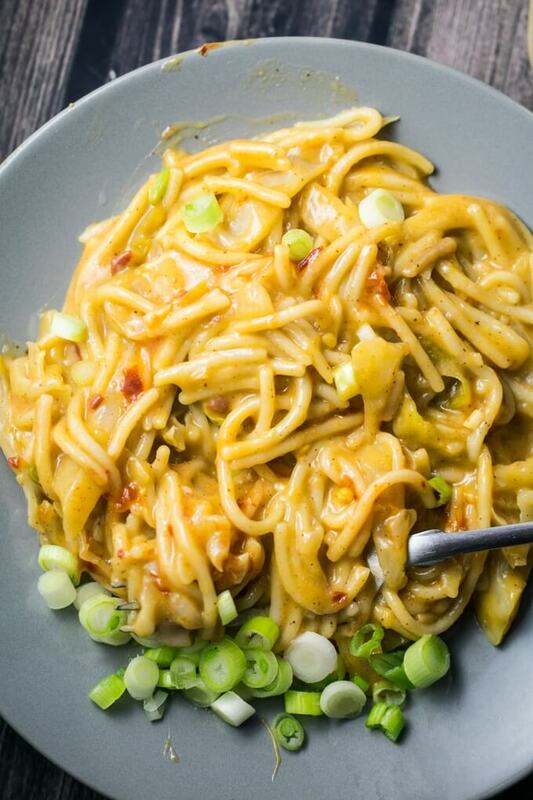 Ridiculously creamy and delicious, one pot almond butter noodles in chili garlic sauce. Easy and flavorful. Everything cooks in one pan, including the noodles, for fast cleanup. In a large saucepan (preferably the largest you have), heat the coconut oil over medium heat. Add the onion with a sprinkle of salt, and stir. Continue to cook, stirring frequently, for about 3-4 minutes or until the onion is translucent. Add the cabbage, another pinch of salt, and continue for 3-5 minutes more, until the onion is softened and the cabbage has started to shrink down. Add the minced garlic, stir, and cook for 30-60 seconds until fragrant. Add the tomato and stir. Stir in the vegetable broth, soy sauce, rice vinegar, and sriracha, and bring the pot to a boil. Add the brown rice spaghetti to the pan. (Break the pieces in half if needed so that they aren't sticking out of the pan). Reduce to a gentle but steady simmer; as the noodles soften, stir them in to submerge them completely in the liquid. Cover the pan and cook, stirring frequently - use a pronged utensil of some kind if possible, since the brown rice pasta has a tendency to stick together - until pasta is tender, which will take from 20-30 minutes depending on pan size/shape and exact cooking temperature. Uncover the pan and stir in the almond butter and coconut nectar. Continue to cook, stirring frequently and making sure to scrape the bottom, until pasta is cooked to desired texture and sauce is thickened. Season to taste with additional soy sauce, chili sauce, salt or acid. Serve hot, garnished with green onions or scallions if desired. 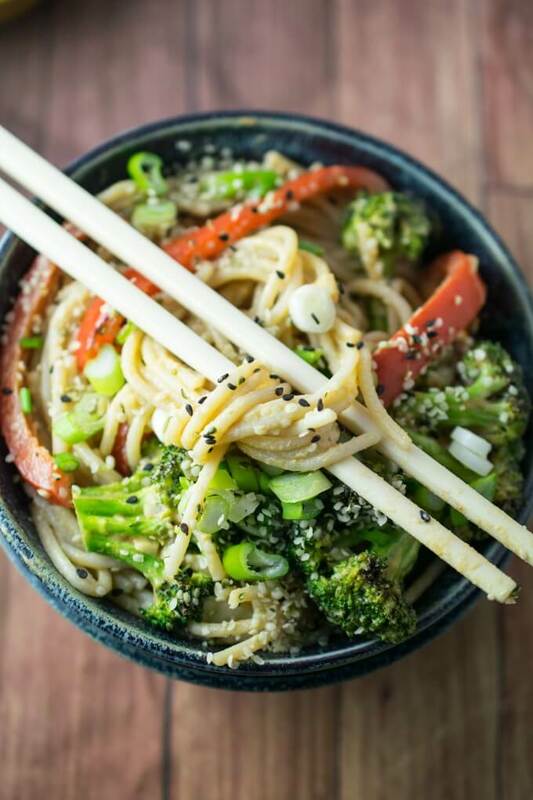 LOW-SODIUM INGREDIENTS: Using low-sodium vegetable broth and soy sauce is quite important to get the right flavor and salt balance in this recipe. The last thing you want is to stir these almond butter noodles for 20 minutes and then have them be too salty to eat in the end! LIQUID AMOUNT: The amount of liquid you need may vary depending on the pan size and shape and on the brand of brown rice noodles that you use. Add more vegetable broth if needed. If the mixture is too soupy, cooked it uncovered for a couple of extra minutes at the end to thicken it. ADDING VEGETABLES: Stir in sliced veggies like bell peppers, carrot, zucchini, etc. right after adding the garlic. LEFTOVERS: This meal is definitely best served fresh; the noodles still taste great when reheated but tend to fall apart a little bit after overnight storage. So just keep this in mind. Personally I still really enjoy the leftovers and usually make a double batch of this recipe for lunches. Inspired by Oh My Veggies. Thank you for this recipe! I loved the juiciness of this recipe that comes from the vegetable broth. I subbed regular organic white spaghetti noodles but kept everything else the same. The noodles took less than 20 mins to cook. You could easily sub peanut butter instead of almond butter too – which I plan to do next time! The cabbage made it feel healthy! And I am always a fan of adding a new veggie into our rotation! Thanks so much for sharing your review! I’m glad you enjoyed it. Oh wow, just made this and it AMAZING! Perfectly spicy and tasty, and filling. I added zucchini slices as suggested with the garlic, and had to use organic wheat spaghetti, but it came out fine. Thank you for this recipe! Doubled the recipe and I’m glad that I did! It was delicious. Thanks! A neutral oil like grapeseed oil, safflower oil, or other vegetable oils would be the best substitution here.